The site calendar may not be correct. Please send inquiry for availability. The rate calculator in the listing IS NOT ours and MAY NOT generate accurate rates. We are unable to remove this feature. Please contact us directly for accurate quote. DISCOUNTS for longer stays. Your Fabulous Las Vegas Vacation: This charming brick 1-story home on 1/2 acre is only 3 miles from the heart of the famous Las Vegas Strip and 7 miles from the airport and is centrally located. It is perfect for your Las Vegas vacation, business trip, or family event. Everything Las Vegas offers is convenient: casinos, shopping, movie theatres, and outdoor recreation sites. The 2000 sq. ft. home is on a quiet lot, away from street traffic with plenty of private parking. The floor plan is open and well lighted. Two bedrooms have floor-to-ceiling wardrobe mirrors. Master bedroom has large walk-in closet. Carpet is elegant and perfectly clean. Ceramic tile floors are in uncarpeted areas. Large capacity washer & dryer; clothes line for swim suits. Relax, Relax, Relax: Enjoy morning coffee and a quiet view on the covered front porch with ceiling fan and glider chairs. Spend the rest of the morning shopping in one of the nearby shopping centers. Make a nice lunch in the convenient, well-equipped kitchen with Corian countertops and stainless steel appliances. Eat your lunch in the kitchen nook with seating for 4-6 or move outside to the patio table and enjoy the view of the well-manicured property. Later, take a swim in the large pool/spa with chaise lounges for enjoying the sun and covered area with table and chairs for snacking and quenching your thirst. Take a nap in the afternoon in the comfortable bedrooms or watch TV or a movie in the family room. Use the wi-fi connected computer to check your email or make show reservations. Relax some more! : Have a drink, prepare your own dinner, or just make a snack before you leave for your dinner destination at one of the nearby restaurants. If you’re “eating in” and feeling formal, enjoy your dinner in the formal dining area. Or, use the close, convenient barbeque grill for a casual night. Eat on the patio table or relax on the more casual wicker furniture. Take some time to catch up on your TV or movie viewing in the comfortable family room or spend time with your family or guests in the more formal living room. Listen to music and have an evening cup of coffee or tea with dessert. Before you end your day, take some time to TOTALLY unwind in the 10-person, relaxing swim spa with a kaleidoscope of lights and a multitude of jets that provide soothing, therapeutic comfort. Discounts are often available. Contact us for details. Sandra. Please submit inquiry or call for our calendar and available dates. Pool can be heated but guests must pay for heating costs. Call owner for estimates. The property is very accessible and has convenient, spacious parking. My wife and I stayed at this property in April 2019 and really enjoyed the experience. The property was clean, very functional, and as described on the website. Sandra was available when we had a question and was very interested in making our stay pleasant and uneventful. I would definitely recommend this property. Very clean, private and relaxing retreat. Our stay was a wonderful time. The home was very clean! Kitchen was well stocked with dishes. Nice to have the use of a washer and dryer. Great privacy and security in the neighborhood where the home is located. Close proximity to the Las Vegas Strip, Red Rock Natural Conservation Area and Mount Charleston to name a few fun adventures. And the new Raiders Stadium will be less than 15 minutes from this fantastic home! The pool and hot tub were spotless and a great treat. Backyard is huge and very private as well. Enjoyed cooking out on the grill while relaxing in the comfortable outdoor furniture. I would highly recommend this home for families or a small group of friends. I can't wait to make arrangements to stay here again. Thank you so much for taking time to write such a nice review of our home. 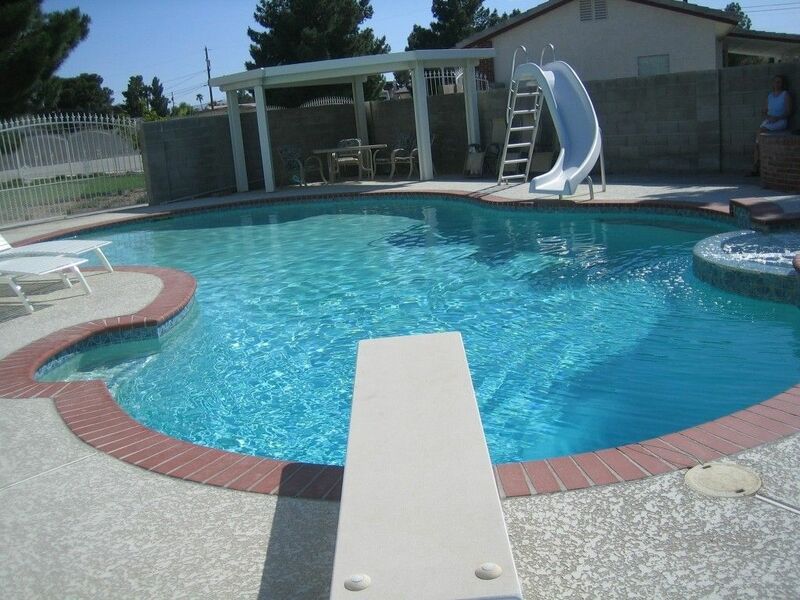 We are glad that you enjoyed your time here as well as the home, pool, and spa. We agree that it is nice to be so close to the Strip and other places famous to Las Vegas but still be in a quiet, private area at the same time. We appreciate your care of our home during your stay and would be happy to have you as repeat guests again in this or any of our homes and offer you our repeat guest discount. Thank you again for such a nice review! Spacious, clean comfortable - a great place to stay. Great place, owner is very accommodating and willing to solve any concerns. Beautiful house and exceptionally clean. We dIdn’t use the pool or hot tub due to weather but they would be great to use in warmer weather. A short drive into the strip for shows and dinner. Overall, we would rent again. Clean, quiet. Safe neighbourhood. LOVED the pool table. Our stay was perfect at Sandra’s. The furnishings are comfortable and the place is lovely. Reading every morning in the LazyBoys was so relaxing. Our three grownish kids (17, 17 and 20) loved the new pool table. We barbecued and had a great time. Uber had a bit of trouble finding the place but we found that if we waited out front to flag down the driver, it was fine. If you use the main house’s address (not the rental’s) it’s fine. Whenever we did see Sandra she was eager to learn how our holiday was going. Otherwise, we had utter privacy. Thanks for everything, Sandra! Thank you so much for taking time to write such a nice review. We are happy that you found our home to be so relaxing and that your "kids" enjoyed their time with the pool table. We agree that having recliners during a vacation helps to make the stay much more comfortable. We are glad that you liked them! Thanks also for the information about using Uber. Most of our guests have rental cars, but since ride shares are becoming much more popular, this is a great suggestion! We will put it in the information notebook in the home. We hope that you will consider our home again (maybe in the summer when it's warmer!). We would be delighted to have you as guests again and offer you our repeat-guest discount. Thank you again for a great review. The house was beautiful, spotless and had everything in it you could possible need. The location is great. Very relaxing sitting outside on the patio. It is in a great spot and very private. I would highly recommend this location. *Las Vegas offers many fabulous golf courses, some of which are within 5-10 minutes of the property. *Snow skiing and other winter activities are 30 minutes away at Mt. Charleston recreation area. Lake Mead offers swimming and all water and boating activities. 3 miles from the heart of the Strip; and 7 miles from the airport. Rates are subject to change without notice. Discount for weekly and monthly rates is not shown in VRBO/HomeAway listed rates. VRBO/HomeAway listed rates do not include holiday fees ($50 to $250 extra). Week night rate increases $25 per night without a weekend night.